On January 23, 2019, the California Energy Commission released a draft document on solicitation concepts for funding of the next round of hydrogen fueling stations. 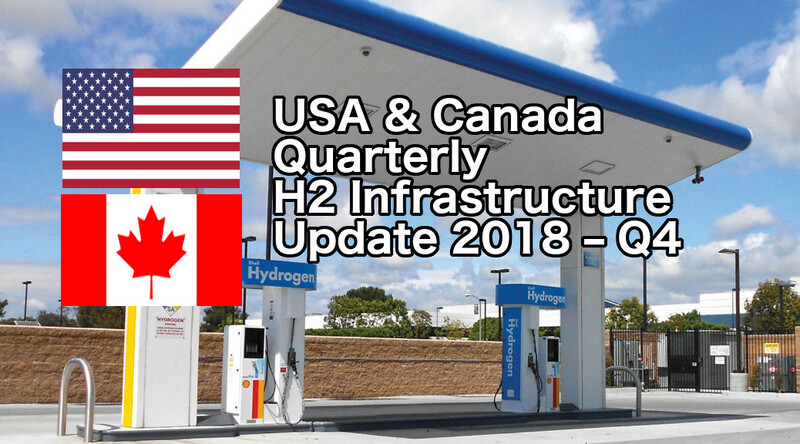 California will be awarding match funding to build out more HRS to hit the magic number of 100 hydrogen refueling stations at which point construction should be self sufficient. In order to be approved for match funding, applicants must meet the criteria laid forth by the California Energy Commission. The document the CEC published on January 23, 2019 is 42 pages long. In this post, respectmyplanet.org will summarize the key points of the document into approximately 3 pages of highlights. 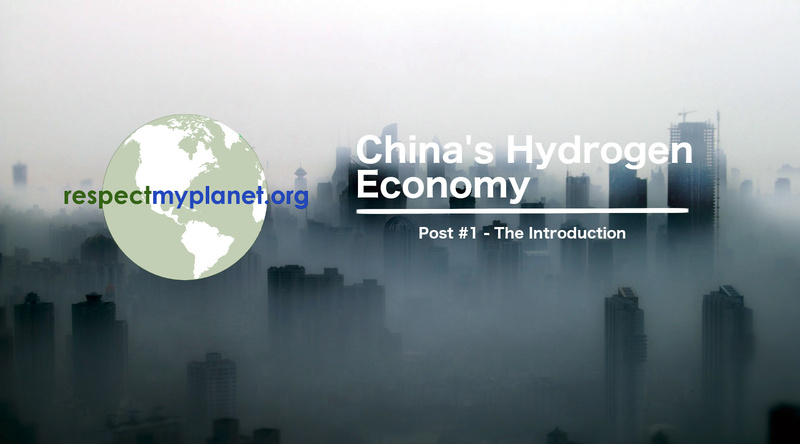 Respectmyplanet.org follows hydrogen infrastructure closely and we hope to learn from California’s leadership. RMP hopes to work with Michigan’s government and surrounding Great Lakes states to put similar clean energy legislative initiatives into place to help protect Michigan’s fresh water for the long haul. What follows is a condensed summary of California Hydrogen Draft Solicitation Concepts . February 22, 2019 – Final comments for draft solicitation concepts are due. The goal of the next solicitation is to provide grant funds to projects to expand California’s early commercial hydrogen refueling and fuel cell electric vehicle (FCEV) markets and to accommodate the projected FCEV roll-out in the 2021-2024 timeframe. 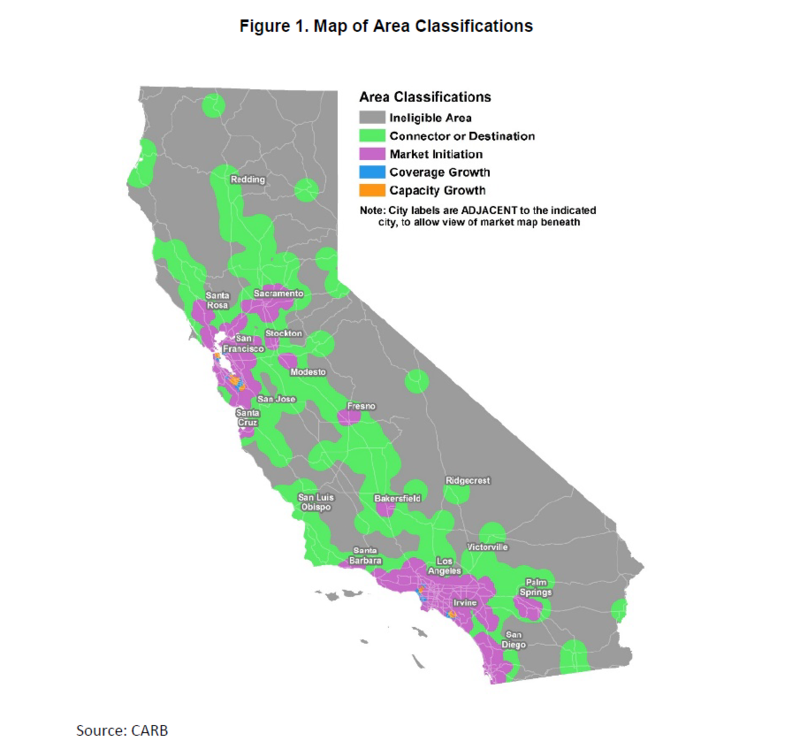 This network of hydrogen refueling stations, hydrogen fuel supply, and FCEVs will support the carbon emissions reduction and air quality improvement goals of the State of California. Hydrogen is one of the alternative fuels that contributes to reducing the carbon intensity of transportation fuels. When the 2018 amendments to the LCFS regulation are put into effect, the Low Carbon Fuel Standard (LCFS) will have a goal of achieving a 20 percent carbon intensity reduction by 2030. Potential Applicants to the next funding solicitation are strongly encouraged to discuss their proposed project(s) with the automobile original equipment manufacturers (OEMs), site owners, station owners, station operators, county and city governmental representatives involved with permitting, environmental review, and fire protection rules and regulations [e.g., the California Environmental Quality Act (CEQA) and National Fire Protection Association (NFPA) 2], and other key project partners. $110 Million dollars. The California Energy Commission reserves the right to increase or decrease this funding at its sole discretion. “Tranches” will be used to describe the entire number of stations from a single applicant. “Batches” will be used to describe a subset of stations within a “tranche” that are approved & in progress at any time. Stations will be funded based on a dollars per kilogram ratio within a 24 hour period. 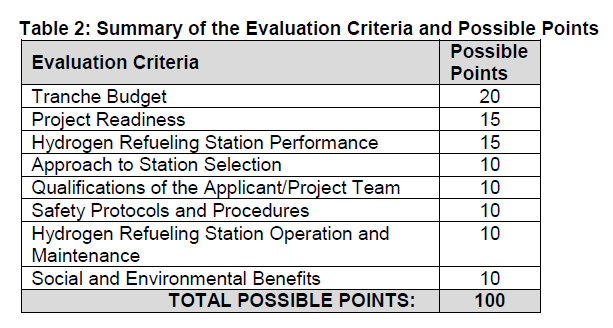 For example, if a station is proposed that will dispense 5,000kg of H2 per day and funding is assigned at $2,000/kg then the station will be approved for $10 million dollars. (i.e. 5,000kg * $2,000/kg = $10,000,000. This should encourage larger stations for key population centers. Eligible costs for reimbursement are limited to allowable equipment expenditures only for light duty hydrogen refueling stations (HRS). Other expenses (i.e. labor, fringe, travel, subcontracted labor, materials/supplies, & overhead) are not eligible for reimbursement. Match funding of 50% of all eligible equipment costs will be supplied by the applicant, again no labor, fringe, travel, et Al…). Only eligible equipment costs are reimbursable & all other costs are to be paid by the applicant. Stage 5 – 100% after being open retail for 5 years & submitting all applicable data to the NREL for their data collection tool. No Operational or Maintenance funding will be provided in this grant. Operational & Maintenance funding may be available through CARB. Funding agreements shall be executed by funding recipient within 90 days following project approval at an Energy Commission Business Meeting. Starting at the bottom of Page 8 of the original document being summarized, we get into the minutiae of milestones, requirements, and evidence of support (Pages 9 through 42). If you’re so inclined, like me, please read the document in its entirety here. Also, check out the California Energy Commission’s webpage calendar event schedule here. The workshop meeting will be held February 12, 2019 in Sacramento, California. Stations must be within the geography of the map labeled “Figure 1” shown below. Must dispense at least 33% renewable hydrogen. Stations will be scored based on criteria shown in image labeled “Table 2” shown below. Each of the methodologies on how to “score points” for your overall score out of 100 in competing against other applicants are described in detail on pages 29 through 42 of the draft document. Each scoring category is shown below in Table 2. GM Defense LLC was recently launched & the new ZH2 full size pickup truck platform was introduced at AUSA in Washington DC. In this post, RMP takes a look at the new full size fuel cell vehicle & it's impressive stats. 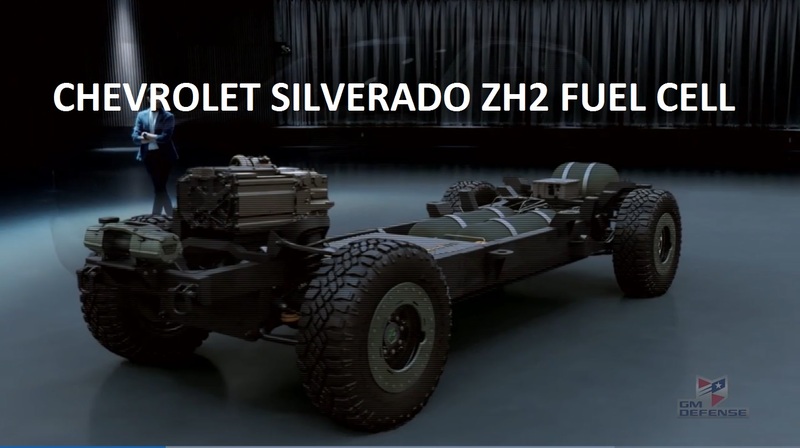 Click through to check out some pictures & a couple cool videos of these new off road heavy duty fuel cell vehicles.